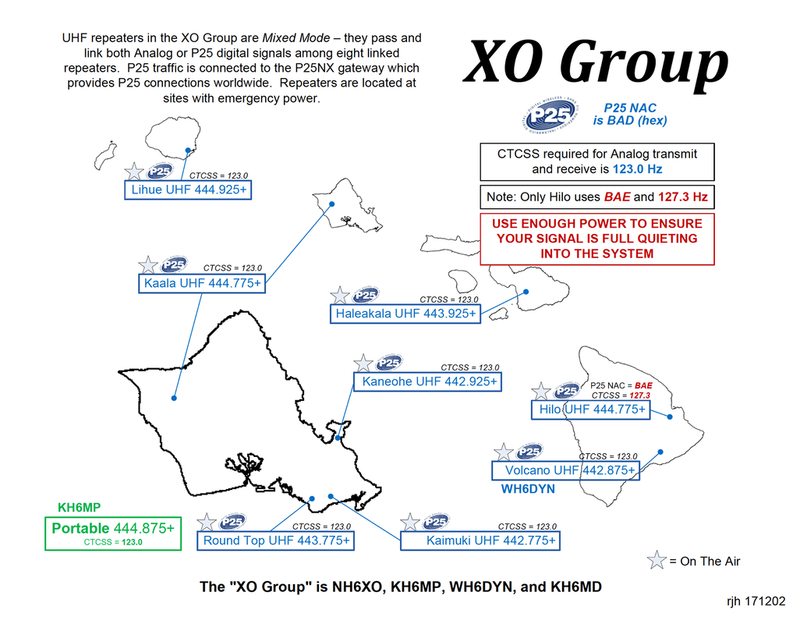 The XO Group recently updated their coverage map and information on their system. It has been added to the Repeaters tab on the KH6RS.com website with a downloadable pdf of the new map. Just click the map to be taken to the XO Group website. It is chock full of details, photos and useful information about the tech and software used in the linked repeater system. Both repeaters have been installed. 147.08 may still have desense problems and may be off the air. The Kahaukuloa repeater is accessible from Central, East and Upcountry Maui. There is also a Winlink gateway station in Waiehu, WH6AV-11 on 145.07. At last check it was off the air due to a transmitter problem. This station is owned by WH6AV and is not part of the MEMA system. 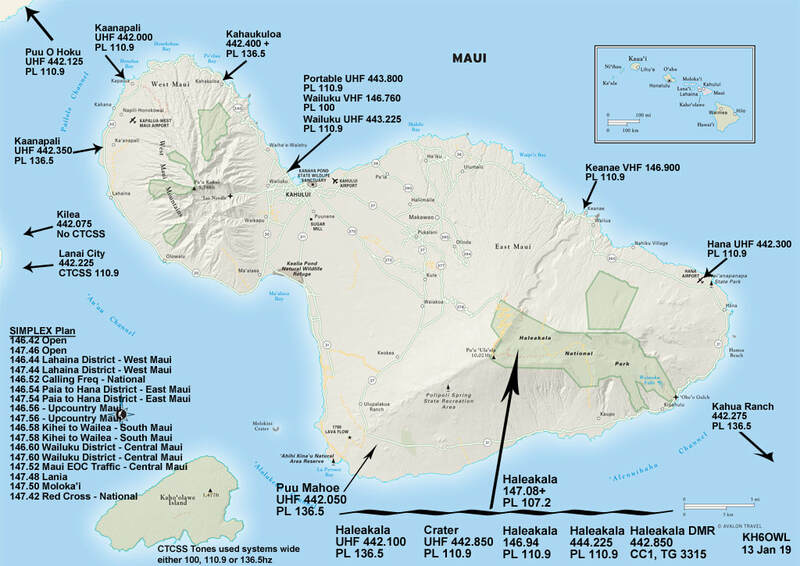 KH6H also reports that the 147.02 Maui County State RACES repeater that was located on Haleakala is still off island undergoing repairs. It is scheduled to be reinstalled in its old location by the end of the first quarter of this year. Print a log sheet or two and the entry form. Look over the rules. You are set to go! With your VHF/UHF FM radio, contact as many stations as you can in as many grid squares as you can, using SIMPLEX ONLY. Every participant submitting a log receives a certificate! Scroll down for more info. Please post your plans in the Comments! 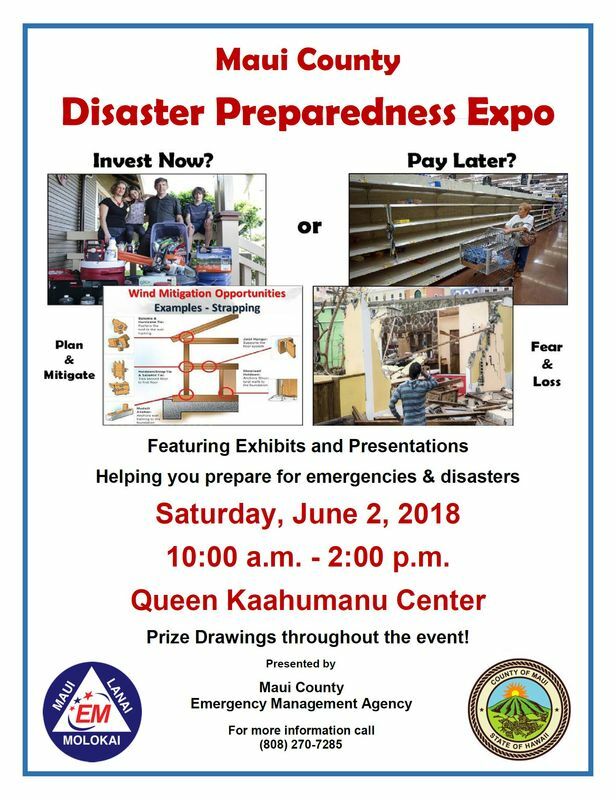 Come visit the Maui Amateur Radio Club table to learn how ham radio can help you during a disaster. 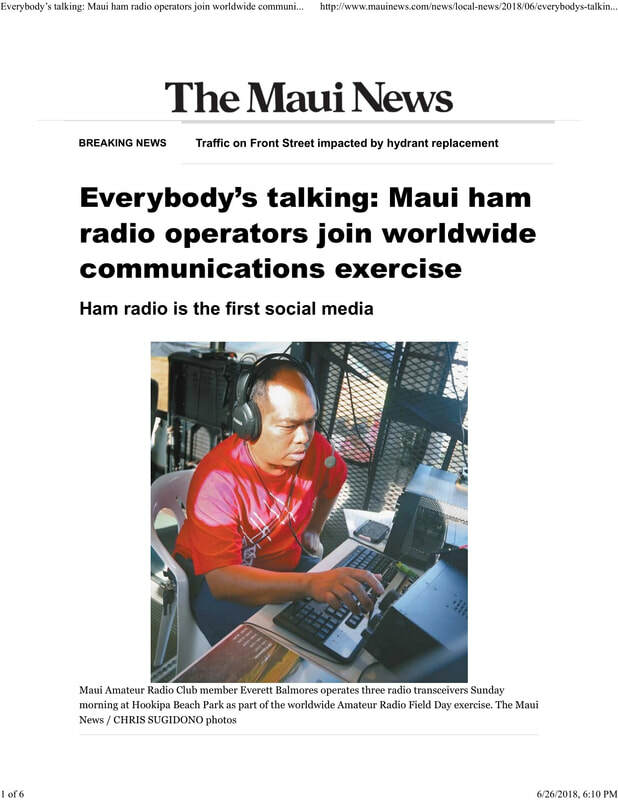 Congrats to Club President WH6FaM for his 5th Place Win in the 2017 Hawaii QSO Party! Minutes of the March, 2018 meeting were distributed and formally approved. The Treasurer's report was distributed and formally approved. Mark, WH7ZK: lives on the big island (BI) and on Maui for work. Rob, WH6DXW: Has a new radio – FTDX3000. He upgraded to Extra a year ago. Bob, N0DQD: Built an IC tester based on an existing design, and got really cheap PCBs from China. Ron, KH6AH: Neighbor's grow lights now off so QRN is gone. However leaving for mainland soon. Jim, KH6HTV: Did a vacation cruise around Asia. Noticed more PSK activity now. Dxpedition is QRV (3B7A). Brought an oscilloscope & box of resistors to give away. Mel, KH6H: Reminded all to check into the Siren net every 1st Monday at 11:45 am. Everett, WH7EZ: Busy, but not on the air. Riley, NH7O: not active this month. John, K6GSS: Loved that Tesla SUV that he saw on O'ahu. Dave, AH6EE: Finished 40 and 20 meter loop antennas but not tested yet. Got on for afternoon net. Shawn, KH6RSB: has a new (used) radio. Alan, AD6E: Broke tower again .. getting it fixed with help from Kent. Did WPX as AD6E/AH6. Robyn, NH7U: Busy with non-ham stuff, FT8 sort of works through the S9 solar panel noise. 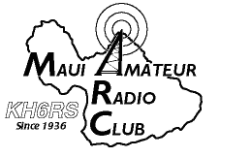 Cherie, WH6FQL: New ham in Lahaina. Emcomm interest and looking for portable equipment. Jim, K6SV: Visiting from the bay area. Anita, AH6AH: Will be giving a “ham cram” class at LDS church on Sat (4/14) with Joe. • Interest from someone on Moloka'i about taking ham exam there. 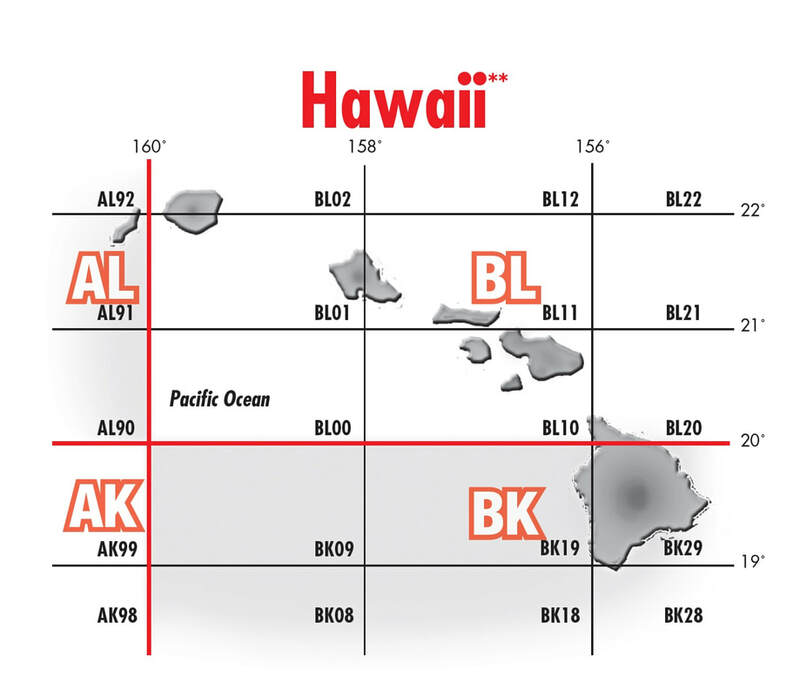 • KH6BFD on the BI is looking for a Maui repeater to link with others using RF. • Rookie Roundup SSB will be April 15 – lots of fun! • There is supposed to be a new ARES net on 40 SSB but it doesn't seem to be happening. can then get that training here. Requirement is FEMA 100, 200, 700, and 800. Short Field Day discussion: Should we do 2A or 3A? Maybe 3A if one is dedicated to FT8. Trip adjourned the meeting at 9:35 pm. NH6Y - Tom : hosted W5JR to operate from his QTH, invited club members to come operate from his shack during upcoming WPX contest, shared recent CW transceiver project kit from QRP Labs, mentioned that Alan and CW Academy have a portable antenna and tuner package with discounted pricing from MFJ. 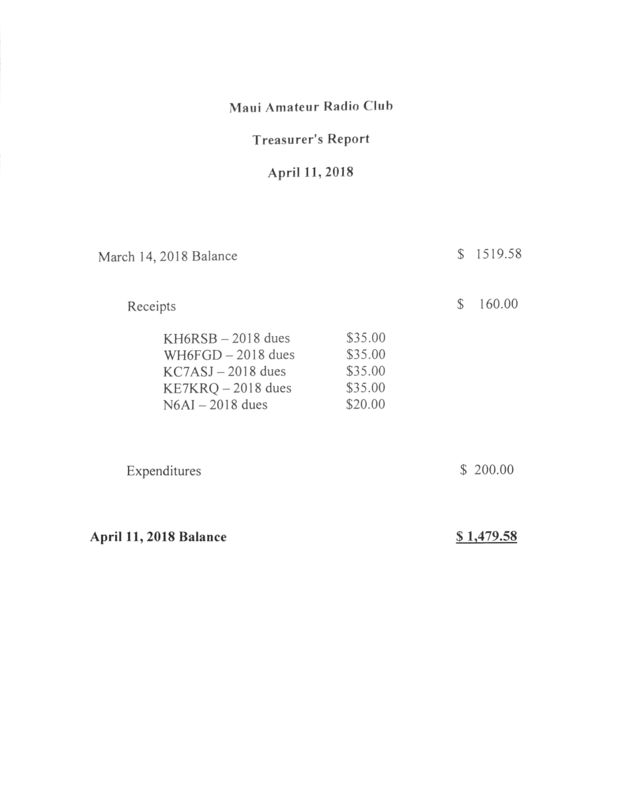 KH6RSB - Shawn : bought a second-hand radio (said it was a good deal), updated the KH6RS.com website, reports that other clubs in Hawaii have not updated their sites. KH6DDT - Dave: Has not been active in the club for some-time but has been licensed since 1977, mentioned a Motorola 2001 Analyzer and a boom truck for tower setup. KH6PO - Diane : Visited widow of Steve Tenney (inherited his radio equipment), told her missile attack story, moved to a new QTH in Huelo and is planning antenna setup. K6GSS - John : described a “banana bug” telegraph key, researching EME, surprised that he isn’t contesting this season. KH6CJJ - Kent: active contesting, Kent was also this months featured member for HAM Radio Auto-biography. First Licensed in 1957 as WH6CJJ : He described MARC (at NASKA) in the 1950s and 60s. His HAM activities from around the world while he was in the Air Force: (Air Force Academy, Wake Island, Johnson Island, Israel /4x, Okinawa - KA6KC) , contacts with the Soviet Union during the Cold War. NH7O - Riley (formerly WH6FEM) : received a new call sign after upgrading to Extra Class: Riley was also our presenter with an entertaining talk on Optics, Electromagnetics, contsructive and destructive interference and holograms and nano-Yagi antennae. He related the personal anecdote of how holograms on comic books lead him to a Ph.D. in physics and an Extra Class Amateur Radio License. 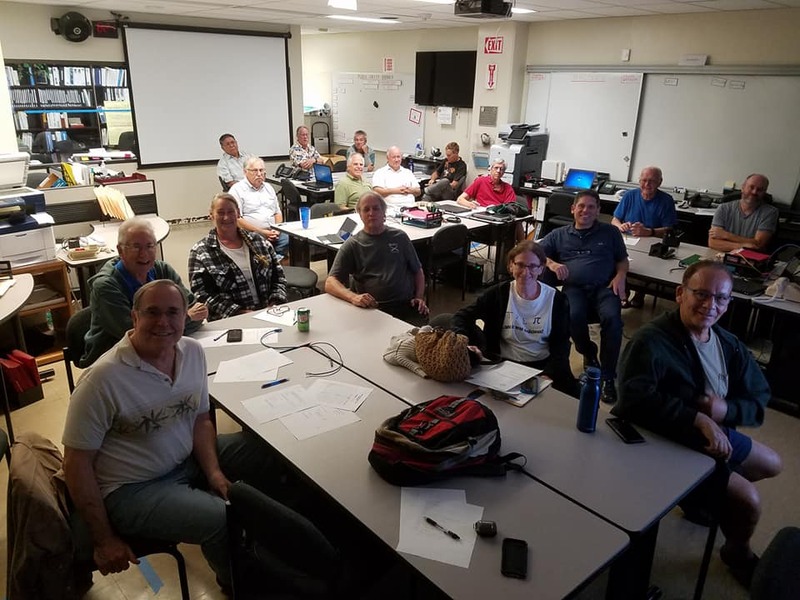 AH6CU - Joe: attended AuxComm training and will share more next month, will be a VE for Ham Prep Class test. AH6AH - Anita: submitted treasurer’s report, will be a VE for Ham Prep Class test. Club Inventory sheet presented as a work in progress. The 2018 Calendar of Events is Out! Reminder, our next club meeting is this Wednesday at the EOC. Minutes of the January, 2018 meeting were distributed and formally approved. Discussion about how much club money will be needed for File Day activities. new licensee after many years QRT. Ron, KH6AH is QRT due to “grow lights”. Cuba visit. Dave, AH6EE is building a magnetic loop antenna due to antenna restrictions. Joe, AH6CU will go th a state wide meeting concerning Emmcon that is outside of ARES and Races. Will report back next month. Tom, G4BKF is visiting his son here for three weeks. This is his 5th visit to Maui. John and Marry, K6GSS showed off a fancy socket. Mary noted she is a 39 year ham veteran. Trip, Elina, Brea, WH6FAM: Trip showed off his LoTW summary of the last six months of activity. Elena made one or two QSOs on kids day. Brea made no QSOs. kit. Also, W5JR will operate ARRL DX contest from NH6Y. Alan AD6E is completing another CW Academy class and will start another one in April. Discussion of doing a membership drive.